I am often asked what kind of “profession” is philanthropy that you have devoted an entire school to it? I first say that it is much more than a profession and that everyone is in some way a philanthropist who helps others or participates in “voluntary action for the public good.” But after I recently spent a few days on Capitol Hill with one of our nation’s largest nonprofits, I have started to think of philanthropy as the dignity business. Last month I joined our partner, The Salvation Army, to speak to legislators about our latest deep dive into the Human Needs Index (HNI) that looked at elevated need in rural America. It was remarkable to see the immediate responsiveness of our legislators to the good work done by The Salvation Army in every state and district. We saw the value placed on this large, respected organization that is in place ready to care for the dispossessed and to do so “without judgement.” Indeed, that is the history of the organization as it began in 19th century England ministering to the outcasts other denominations would not embrace: “Thieves, prostitutes, gamblers, and drunkards” as the official history states. The recent hurricanes were on everyone’s mind but our representatives and their staffs also wanted to better understand the state of our citizenry as captured by the Human Needs Index. 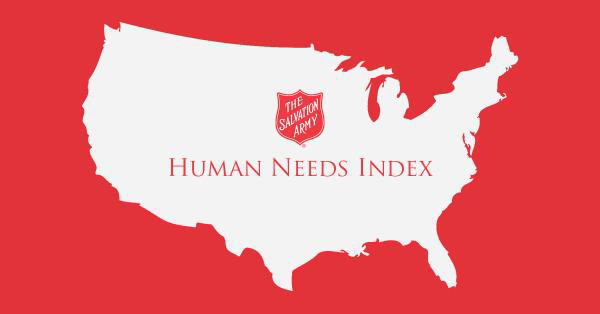 The Index provides a timely supplement to other measures of poverty and material welfare by analyzing the amount of services The Salvation Army provides in every single zip code in our country. It shows an overall picture of how our fellow citizens are doing by measuring how much they are calling on services such as clothing, food, housing, energy, and medical assistance from The Salvation Army. The Index offers us a snapshot into the state of dignity in our country. Every person has dignity by definition (being worthy of honor or respect) and is thus worthy of being helped through the care and concern of efforts such as those marshalled by The Salvation Army. Without the provision of these necessities, it is difficult for people to assert their dignity in the sense of claiming their rightful respect and worth in their own eyes as well as those of others. Churches, social service organizations, schools, and political advocacy movements all seek to create the conditions for people to exercise their dignity. From satisfying material needs to enabling creative expression through the arts, philanthropy seeks to engage others so they can attain or express their human dignity. But it is the philanthropist as well who seeks respect, satisfaction and in some cases redemption by engaging in the business of dignity. The Salvation Army uniform is well recognized as a symbol of the service the men and women who wear it provide “without judgment” to those in need. How dignified they look and how well deserved was the appreciative gaze that greeted them everywhere I joined them. But the business of dignity is not only practiced by ministries and the nonprofit sector. At the launch of the HNI, the former CEO of Krispy Kreme and current board chair of The Salvation Army, Tony Thompson, spoke about the role of well-managed food service companies that provide opportunities for entry-level employees to rise into top corporate positions. There is no dignity like that provided by the self-sufficiency attained through a job. Also joining the launch was U.S. Senator Tim Scott from South Carolina, who spoke of the empowering experience of self-directed wealth creation, but also of the laws that treat all of us fairly and equally, guaranteeing equality and dignity before the law. The business of dignity is not all about salving wounds and uplift. Once we have basic necessities met, we begin to notice our relative position in society and that also begins to affect our sense of dignity. Research increasingly shows that cognitive, health, educational and income outcomes are influenced by one’s relative position in society, making it difficult for those who begin with little to escape their condition. This is akin to what Warren Buffet refers to as the ovarian lottery. Politics are directly about the contestation for position and dignity in society. When the overall economic pie grows, it is easier to accommodate these conflicts as everyone’s position is improving, regardless of where they stand relative to others. But when the pie is not growing or when the growth is largely confined to those who already have the largest pieces, relative position becomes more important and more strongly felt. This provides politicians and their intellectual or ideological accompanists greater opportunities to formulate interpretations of relative disparities and to craft proposals for correcting them. So politicians are also in the dignity business, acting like entrepreneurs who seek to fill a need. They market its salience while proclaiming that they have just the product or service to address it. When we find these politicians outside the formal boundaries of government, we refer to them as advocates and more readily recognize their place in the philanthropic landscape. But politics is different when one is dealing with masses of strangers who are only related through abstract common principles, shared experiences of spectacles, or the kind of civic education that has been on the wane. It is easier to discount the dignity of more distant strangers, as it is often appropriate to value more highly those who are closest to us. With the exception of some disasters where we see others stripped of everything but the common humanity that unites us, distance tends to dampen our concern for others’ dignity. Indeed, throughout history we have seen much more nefarious violations of others’ dignity when we could think of them as culturally or physically distant and different in some fundamental way. Even in our intimate circles, the quest to adjudicate relative positions of dignity can also lead to fraternal bloodshed. Still, it is more difficult to systematically dehumanize or distance those with whom one has ongoing, personal interaction. Several commentators on the current state of our national polarization have expressed optimism about the prospects for localities to get things done, as this is where we have personal experiences with each other and where we must learn to work together if we are to solve our shared problems. When you look someone in the eye it is more difficult to discount their dignity than if you see them as a bit player in a very large impersonal story about how you came to your deeply felt and robustly justified grievance that you feel is injuring your dignity. The dignity business is everybody’s business, but some do it much better than others. And different people and different sectors take the lead at different times. Today we need everyone to realize that they are not only worthy of claiming dignity but also that they are capable and expected to share it with others. This is why I am a great admirer of The Salvation Army’s insistence on putting human dignity first, without judgment. Learn how the Bill & Melinda Gates Foundation is working to increase the quantity and quality of generosity by all people, from high net worth individuals to everyday givers, through its Giving by All initiative and its philanthropic partnerships. 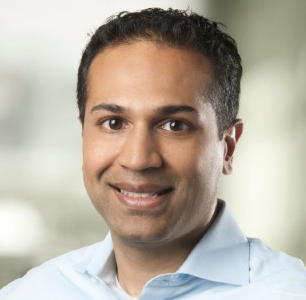 Nageeb Sumar, deputy director on the philanthropic partnerships team at the foundation, will kick off the school’s 30th Anniversary Speaker Series with a free, public talk on Nov. 7 at 6:00 p.m. on the IUPUI campus. Sumar oversees the foundation’s work on policy, systems and innovation in philanthropy. He previously served on its donor government relations team, where he led and oversaw the foundation’s engagement with Canada, Australia, Japan and Korea, and assisted its U.S. government relations team in building support and partnerships around the foundation’s polio and vaccines work. He has also worked as an associate at law firms in Washington D.C. focusing on international finance transactions, and at Oxfam America on microfinance and market access issues. Larry Kramer, president, William and Flora Hewlett Foundation, will speak about “Fixing Congress: Before and After (the 2016 election, of course)” on Jan. 18, 2018. Kramer served from 2004 to 2012 as Richard E. Lang Professor of Law and Dean of Stanford Law School. He spearheaded significant educational reforms, pioneering a new model of multidisciplinary legal studies while enlarging the clinical education program and incorporating a public service ethos. At the start of his career, Kramer served as a law clerk and then professor of law at the University of Chicago and University of Michigan. He joined the New York University School of Law in 1994 as associate dean for research and academics and Russell D. Niles Professor of Law. Kramer is a fellow of the American Academy of Arts and Sciences and a member of the American Philosophical Society and the American Law Institute. He also serves on the boards of a number of nonprofit organizations. Scott Harrison, founder and CEO, charity: water will discuss “Reinventing Philanthropy” when he delivers Lake Institute on Faith & Giving’s Thomas H. Lake Lecture on March 8, 2018. This program is part of the Indiana University Bicentennial Lecture Series. Turning his full attention to the global water crisis and the world’s 663 million people without clean water to drink, Scott created public installations and innovative online fundraising platforms to spread international awareness of the issue. In 10 years, with the help of more than 1 million donors worldwide, charity: water has raised over $250 million and funded over 23,000 water projects in 24 countries. When completed, those projects will provide over 7.1 million people with clean, safe drinking water. Scott was recently recognized in Fortune Magazine’s 40 under 40 list, the Forbes Magazine Impact 30 list and was recently No. 10 in Fast Company’s 100 Most Creative People in Business issue. He is currently a World Economic Forum Young Global Leader. Joel Fleishman, professor of law and public policy, Duke University School of Law, will speak about “Putting Wealth to Work” on March 22, 2018. Fleishman joined the Duke faculty in 1971, was founding director of what is now the Sanford School of Public Policy, and has served Duke as vice president, senior vice president, and first senior vice president. Taking part-time leave from Duke from 1993-2003, he became president of The Atlantic Philanthropic Service Company (NYC), the U.S. program staff of Atlantic Philanthropies. Fleishman was director of the Sanford School’s Center for Strategic Philanthropy and Civil Society and director of the Sanford School’s Samuel and Ronnie Heyman Center for Ethics, Public Policy and the Professions. He was chairman of the Board of Trustees of The Urban Institute until stepping down in May 2014, and he currently serves on the Board of Directors of the Ralph Lauren Corporation. Marissa Nielsen, M.A. ’16, knew she wanted to do something fulfilling and meaningful for her career, but wasn’t sure what. 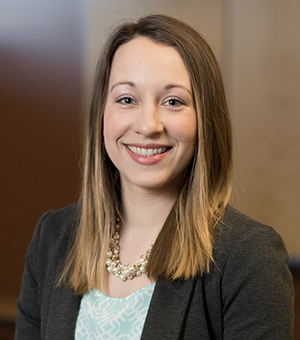 Her communications degree from Spring Arbor University in Michigan first led to a job with a local newspaper, but she soon found her true passion when she connected with her local community foundation’s board president and began to work there. However, Nielsen’s husband Paul, M.A. ’15, was looking for a career change, and applied to the master’s degree program at the Lilly Family School of Philanthropy. “The school is so well-known. As soon as he got his acceptance letter, we knew we were moving to Indy. If you get in, that’s exactly where you need to be,” Marissa said. Paul began classes while Marissa worked at a nonprofit, and he soon realized the program would be a great fit for Marissa too. Thanks to her work at the Homer Area Community Foundation in Michigan, Marissa knew she wanted to work with foundations. She served in a graduate assistantship at the Smithville Charitable Foundation, a private foundation in Monroe County, Indiana. Marissa also interned at the Christel DeHaan Family Foundation with alumna and former chair of the school’s Board of Visitors Melynne Klaus, M.A. ’03, as her mentor. Her classes also were enlightening and informative. Together, Marissa says, her classes and off-campus experiences all contributed to her growing knowledge and experience and gave her a network of people working in foundations because she took advantage of the opportunities the program offered. After graduating, she soon earned a job at the Central Indiana Community Foundation, where she now works as a philanthropic advisor. The school’s 2017 fiscal year was a banner year for new gifts and commitments totaling $8.9 million, the second highest for fundraising in our three-decade history. This success was mirrored across all Indiana University schools and campuses, prompting IU President Michael McRobbie to recently announce a new goal of $3 billion for the current For All Bicentennial Campaign, up from the earlier $2.5 billion goal. He also extended the campaign an additional six months—it will now conclude on June 30, 2020 to coincide with the end of IU’s Bicentennial Year. The campaign’s extension will give the Lilly Family School of Philanthropy an additional six months to raise the remaining $17.5 million of our $50 million goal. 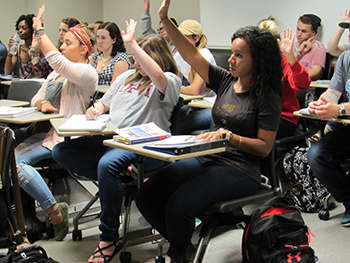 The school’s top priority continues to be funding for student scholarships and fellowships. As a reflection of our 30th anniversary celebration, we invite you—our friends and alumni—to join us by supporting the future leaders of philanthropy. National arts and cultural leader Jane Chu, Ph.D. ’12, has been named the recipient of the Indiana University Lilly Family School of Philanthropy’s 2017 Distinguished Alumni Award for her significant achievements in philanthropy. The award was presented by Tami Tarpley, M.A. ’10, chair of the school’s alumni association. The 11th chairman of the National Endowment for the Arts, Chu has a strong background in philanthropy and in arts administration. Throughout her professional career, she has served in leadership positions in a number of philanthropic institutions, including organizations committed to strengthening the arts, culture, and local communities. As president and CEO of the Kauffman Center for the Performing Arts in Kansas City, Missouri, Chu oversaw a $413 million campaign to build the center. She previously was a fund executive at the Kauffman Fund for Kansas City, and had served as vice president of external relations for Union Station Kansas City. She also was vice president of community investment for the Greater Kansas City Community Foundation.